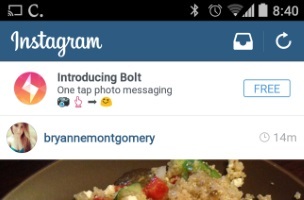 The newest app from Facebook/Instagram — leaked last week — Bolt, is official. The company announced Tuesday that Instagram Bolt has been launched for iOS and Android users in New Zealand, Singapore and South Africa. Bolt is a way for people to quickly share images via one-on-one messaging, somewhat similar to the most recent app Facebook launched, Slingshot. Bolt is the fastest way to share an image or a video — just one tap to capture and send. We decided to start small with Bolt, in just a handful of countries, to make sure we can scale while maintaining a great experience. We expect to roll it out more widely soon. Readers: What do you think about Bolt?